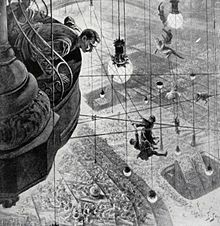 The Sleeper Awakes (1910) is a dystopian science fiction novel by English writer H. G. Wells, about a man who sleeps for two hundred and three years, waking up in a completely transformed London where he has become the richest man in the world. The main character awakes to see his dreams realised, and the future revealed to him in all its horrors and malformities. 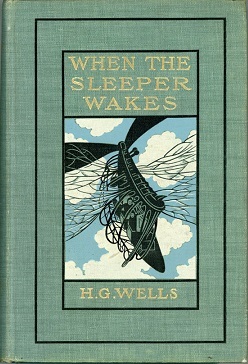 The novel is a rewritten version of When the Sleeper Wakes, a story by Wells that was serialised between 1898 and 1899. 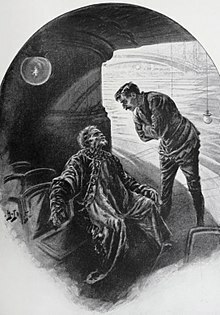 The novel was originally published, as When the Sleeper Wakes, in The Graphic from 1898 to 1903 and illustrated by H. Lanos. Dissatisfied with its original form, Wells, who was an outspoken socialist and author of prophetic writings, rewrote it in 1910. "Like most of my earlier work", he wrote in the 1910 edition's preface, "it was written under considerable pressure; there are marks of haste not only in the writing of the latter part, but in the very construction of the story". 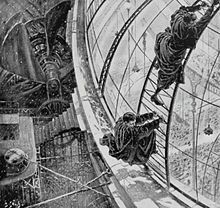 The short story "A Story of the Days To Come" (1897) is a forerunner of the novel, being a tale set within the same future society. Graham, you must come away! Graham gets a history lesson from the old man. Graham addresses himself to the unseen multitudes. When he wakes Graham is disorientated. The people around him had not expected him to wake up, and are alarmed. Word spreads that the "Sleeper" has awakened. A mob gathers around the building and demands to see the fabled Sleeper. The people around Graham will not answer his questions. 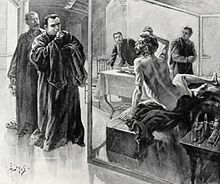 They place Graham under house arrest. Graham learns that he is the legal owner and master of most of the world. Rebels led by Ostrog help Graham to escape. They say that the people need Graham's leadership to rise against the White Council. Unconvinced, but unwilling to remain a prisoner, Graham goes with them. Graham arrives at a massive hall where the workers have gathered to prepare for the revolution. They march against the White Council but are soon attacked by the state police. In the confusion, Graham is separated from the revolutionaries. He meets an old man who tells him the story of the Sleeper - the White Council invested his wealth to buy the industries and political entities of half the world, establishing a plutocracy and sweeping away parliament and the monarchy. The Sleeper is just a figurehead. The old man thinks that the Sleeper is a made-up figure used to brainwash the population. Graham meets Ostrog, who says that the rebels have won and that the people are demanding that the Sleeper should rule. Ostrog retains power while Graham becomes his puppet ruler. Graham gets interested in aeroplanes and learns how to fly. He sees from the air that no-one lives in the country or small towns any more, all agriculture being run like industry; and that there are now only four huge cities in Britain, all powered by huge wind-mills. His carefree life ends when Helen Wotton tells him that for the lower class the revolution has changed nothing. Graham questions Ostrog who admits that the lower classes are still dominated and exploited but defends the system. It emerges that Ostrog only wanted to take power for himself and has used the revolution and Graham to do so. Ostrog admits that in other cities the workers have continued to rebel even after the fall of the White Council. Ostrog has used a black African police force to get the workers back in line. Graham is furious and demands that Ostrog keep his police out of London. Ostrog agrees. Graham decides to examine this new society for himself. Graham visits London in disguise to see how the workers live. Their lives are ghastly. Unskilled workers toil in factories, paid in food for each day's work, with no job security. They speak a dialect so strong that Graham cannot understand them. Industrial diseases are rife. Workers wear uniforms of different colour according to their trade. The family unit no longer exists and children are cared for in huge institutions. Lives are dominated by "babble machines" which spread news and "pleasure cities" where unspecified joys are available. "Euthanasy" is considered normal. Graham learns that Ostrog has ordered his troops to London. Graham confronts Ostrog, who tries to arrest Graham. The workers rise up again and help Graham to escape. He meets Helen and learns that it was she who told the public about Ostrog's treachery. Graham leads the liberation of London. Ostrog escapes and joins his troops who are flying to London. His men still hold a few airports. The workers find anti-aircraft guns, but they need time to set them up. 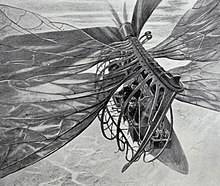 The revolutionaries have only one aircraft; Graham gives away all of his wealth to the rebels and proceeds to fly the one aircraft against the invaders, bringing some of them down. The revolutionaries get the anti-aircraft guns working and start to shoot down the invaders. Graham attacks Ostrog's aeroplane but fails. Graham's aeroplane crashes. Themes include socialism; the betrayal of revolution; and how an elite can manipulate a population both by oppression and impoverishment on the one hand, and by the use of technology and provision of pleasure on the other. In this respect, the book has elements explored later both in Brave New World by Aldous Huxley and Nineteen Eighty-Four by George Orwell. Floyd C. Gale of Galaxy Science Fiction said of The Sleeper Awakes despite the "impossibly timid" and outdated science, "The worth of the story lies in its human values ... This is 'Young Wells' at his non-Utopian best". Aspects of the novel's storyline are similar to the plot of the Woody Allen 1973 film Sleeper. 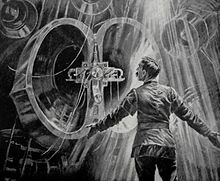 Pulp writer Harry Stephen Keeler took the idea further in a 1914 story called "John Jones' Dollar", in which a solar system's economy is built around a single silver dollar left to accumulate until the year 2921 to the "astounding" sum of $6.3 trillion, financing an interplanetary socialist paradise. The Futurama episode "A Fishful of Dollars" is loosely based upon Wells's novel. Fry discovers that his bank account has continued to accrue interest over the course of a thousand years. ^ Wells (1910). "Preface". The Sleeper Awakes. Wikimedia Commons has media related to When the Sleeper Wakes. This page was last edited on 5 April 2019, at 04:08 (UTC).